Info "Hammer the nails in straight!" On Point (Spot On! in the PAL version) is one of Penny's Microgames in WarioWare: Smooth Moves. 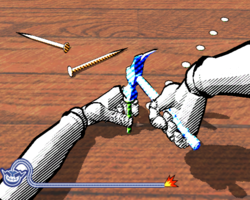 The player has to hammer the nail into the hole. 1st level difficulty: Small nail. 2nd level difficulty: Medium nail. 3rd level difficulty: Long nail. This page was last edited on February 26, 2018, at 01:11.